About Us | New & used powersports dealership located in Fayetteville, Tennessee. Polaris & Honda. We are a family-owned & operated Honda/Polaris ATV and motorcycle dealership in Fayetteville, TN. We have been in business for more than 32 years. 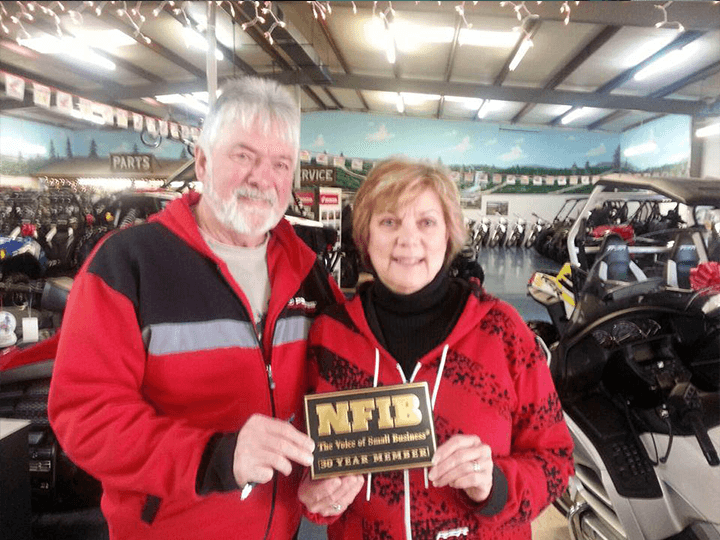 Pictured are owners, Clay and Sherry Jacks, with their NFIB (National Federation of Independent Business) award for 30 years of membership. Welcome to Fayetteville Cycle located in Lincoln County, Tennessee, just north of Huntsville Alabama. We offer great prices on new Honda and Polaris motorcycles and ATVs as well as used motorcycles and ATVs of all types. Home of good prices and great service. Check with Fayetteville Cycle before going anywhere else. We are middle Tennessee’s premier Honda and Polaris dealer. We have a full service department as well as a huge selection of helmets and other accessories.